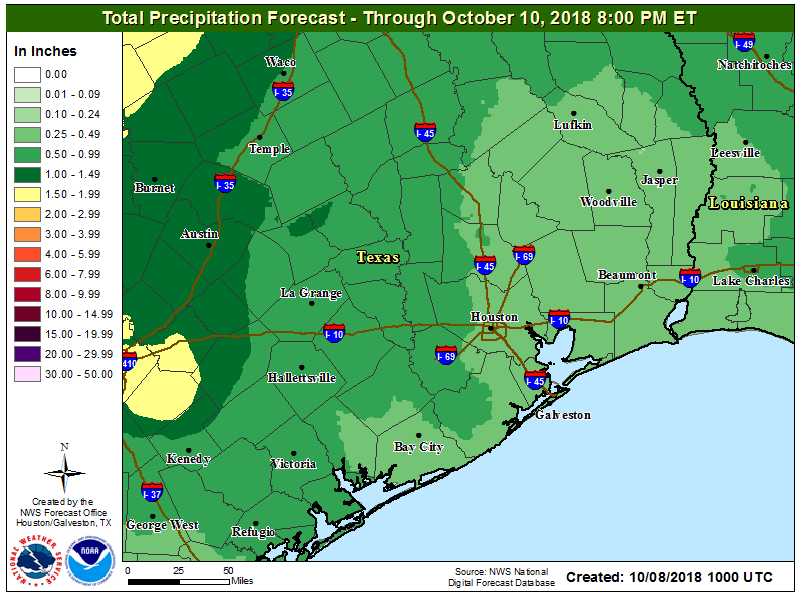 It has been a torrid start to October, with six consecutive 90-degree days in Houston. We’ll remain in this steamy, hot, and humid pattern for only a few more days before fall’s first moderately cooler and significantly drier weather finally arrives later on Wednesday, in the wake of a front. Houston’s temperature last fell below 65 degrees on May 15th, nearly five months ago. This has been a long summer, y’all. But now it’s almost time for fall. With lows in the mid- to upper-70s it’s incredibly warm across the region for October, and with partly sunny skies we should see high temperatures near or at 90 degrees today. Some scattered showers and thunderstorms are possible, but we shouldn’t see anything too widespread due to the lack of forcing. Moisture levels will be higher than Monday, and as a result we expect that probably about half the region will see rain on Tuesday. Accumulations should be less than 0.5 to 0.75 inch for the most part in what will otherwise be a hot and steamy day, with high temperatures in the vicinity of 90 degrees. Increasing clouds could keep most western areas in the mid- to upper-80s. The first real front of fall won’t be that strong, but it will bring some drier air and overall relief to the area. This day will still be warmer, with drying air allowing temperatures to push into the upper 80s. But lows Wednesday evening should fall into the 60s for most of the region, except for immediately along the coast, and the drier air will feel immeasurably better as the sun goes down. Nice, sunny, fall-like days with highs generally in the mid-80s and overnight lows in the 60s. We expect mostly sunny skies this weekend, with a moderate chance of rain later on Saturday or Sunday as a stronger front pushes into the region late this weekend. For now, we expect partly sunny skies, with highs in the low 80s ahead of the front, and cooler weather behind it. Again, the big question is whether this is a dry passage, or whether some showers linger after the front moves through. Either way the majority of next week looks absolutely stellar for Houston, with highs likely in the 70s and lows in the 50s. Did you want fall? Because fall is coming to you. 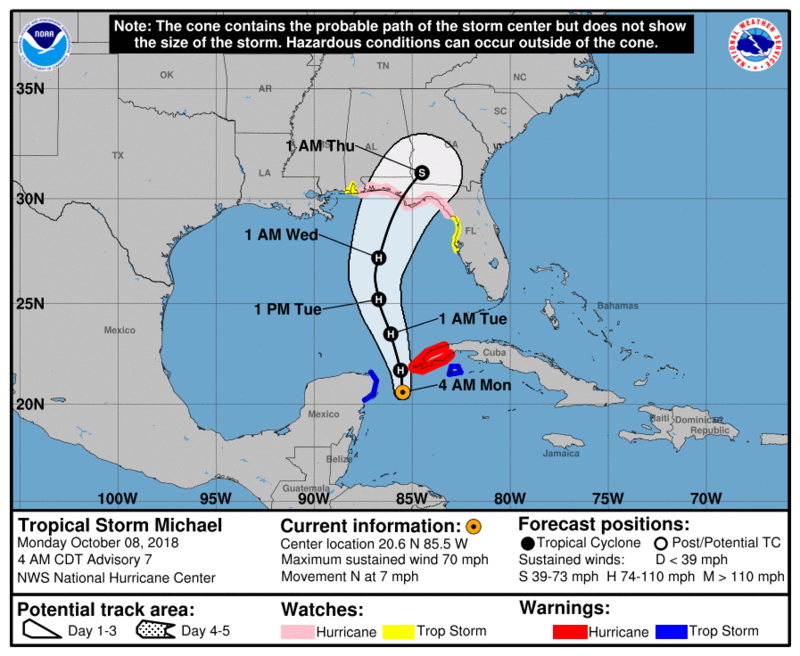 On Sunday, we noted the formation of Tropical Storm Michael in the Caribbean Sea, and its potential for rapid strengthening as it moved north into the Gulf of Mexico. This still seems likely, with the storm seeing ideal conditions for intensification—quite possibly to a major hurricane—before it moves into the Florida panhandle later on Wednesday or Thursday. This is storm to be taken seriously by residents of Florida and Georgia along, and to the right of its path. The biggest concerns are storm surge and winds. Hey Eric, I’m more relieved than anyone to hear that fall’s on the way, but I’ve been checking front maps and it shows that there’s no cold front our way, in fact, it’s showing that there’s a warm front pushing back in to the north. All of my weather apps are still showing 90 degree days for the rest of this week. Is it possible that this cooling front could stall before it gets to us? TWC, WU and AW all show the front. I’m seeing predictions of cooler weather on my apps, and am hearing about it on the local news..
Kev, from what I understand, Hurricane Mike is one of the forces bringing cooler drier air our way for our first cool front…I am keeping my fingers crossed that subsequent cool fronts make their way to Houston / Galveston one after the other, it’s about time, lol….I have read some hints that Mike’s jealous girlfriend ( next Caribbean Gyre formation 7-10 days out) may follow him into the Gulf..
Not saying that these hints have me worried, today they are too far out to be accurate.. The cooler, drier weather is happening. What are the models showing about another storm following in Michael’s footsteps? We are getting ready to be gone for 2 weeks starting this Sunday and I am feeling a bit anxious. I heard on one of the news stations that Michael is not our storm but the future one ~10 days from now is another story. Not sure how they can say that so far in advance. Thank you! as Michael, somewhere in the eastern half of the Gulf.. I know I sound like a broken record, but I finished watching a live weather broadcast out of Florida ( loved ones in Florida)..This person mentions something forming in the Caribbean ( wish I could attach the screenshot I took) and moving west..He didn’t clarify if it would be in the Caribbean, on October 19th thereabouts, or in the Gulf making landfall by that timeframe ..Any thoughts? Wouldn’t nighttime temps in the 60’s deter such a tropical system from hitting us? What source do you usually read that points to the Caribbean development? We are supposed to be leaving on Sunday and I am nervous leaving if there is a possibility of another storm forming. Maybe you could ask your question on today’s post? Thank you! Bout time we had a front. After all, today is Thanksgiving Day………………………………… in Canada. Hi Eric. My wife are in a condo on the beach in Orange Beach,Alabama. I trust your advice so would you leave early or ride it out. Personally I would ride it out from that location. Probably a 10 percent or less chance of hurricane-force winds, and storm will move away fairly quickly. Check the forecast over the next 24 hours to ensure it doesn’t make an unexpected jog to the west. Mikey is now officially a himicane. 80 MPH. Eric. Please clear the air on the above comments…is there a potential tropical issue 10 days out? If so, what are models indicating and what is your opinion on chances there will be a Houston impact? Gents, What does South Padre Island weather look like for 10/13 thru 10/19?